Apple updated its MacBook line today with faster Intel Core 2 Duo processors, 1GB of memory and larger hard drives in every model. The one-inch thick MacBook comes in three models: white 2.0 GHz and 2.16 GHz MacBook models, and a black 2.16 GHz MacBook model. 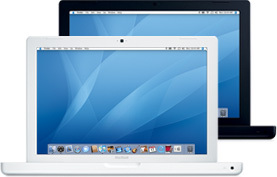 The MacBook includes a built-in iSight video camera for video chatting on-the-go with friends or family using iChat AV, recording a video podcast or iMovie using iLife ‚Äò06, or taking fun snapshots with Photo Booth. The MacBook includes Apple‚Äôs MagSafe Power Adapter that magnetically connects the power cord to the MacBook and safely disconnects when under strain, and the latest generation of 802.11n wireless networking for up to five times the performance and twice the range of 802.11g. At prices starting at $1,099 (less for students & teachers), MacBooks are an excellent option for podcasters. They come with iLife ‚Äò06, featuring iPhoto, iMovie HD, iDVD, GarageBand and iWeb. iMovie and Garageband are two of the most popular apps for podcasters. The MacBook also comes with the latest release of the world‚Äôs most advanced operating system, Mac OS X version 10.4.9 Tiger, including Safari, Mail, iCal, iChat AV, Front Row and Photo Booth. The new MacBook is available immediately through the Apple Store (www.apple.com), Apple‚Äôs retail stores and Apple Authorized Resellers. Additional build-to-order options for the MacBook include the ability to upgrade to 120GB or 160GB (5400 rpm) or a 200GB (4200 rpm) hard drive, up to 2GB DDR2 SDRAM, Apple USB Modem, Apple Mini-DVI to DVI adapter, Apple Mini-DVI to VGA adapter, Apple MagSafe Airline Adapter and the AppleCare Protection Plan. Additional build-to-order options also include pre-installed copies of iWork ‚Äò06, Logic Express 7, Final Cut Express HD 3.5 and Aperture 1.5. I have been waiting for a MacBook update to switch. I’ll take this with 2GB of ram. Finally. we’re looking at the same thing – the Macbooks are a great deal, and can even drive a big monitor if you want them too. Does this mean I can have one? Please oh please? I’ll trade you a new Mac for a piece of Diane’s coconut cake.